I have yet to meet a person who does not like enchiladas. There is something about them that are so satisfying; maybe it’s the gooey warm fillings or that the entire dish is smothered in sauce that makes you feel like you are being hugged from the inside. 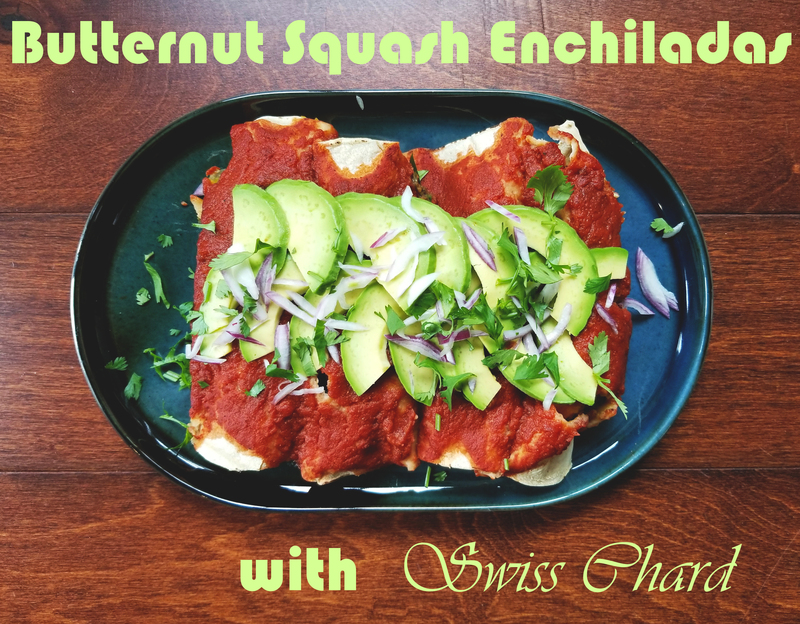 The enchiladas I have come across always lean towards heavy cheeses, oils, and shredded beef or chicken. I wanted to give my spin on a hearty, comforting classic with nutritious and satisfying plants, perfect for a cold fall or winter night. I decided to use the sweet and nutty butternut squash as my base. A powerhouse of nutrition, butternut squash is loaded with vitamin A, potassium, and is low in fat. Paired with black beans and swiss chard you have a great source of protein, iron, and fiber, which in my eyes is a win-win-win. I wanted to pick up the heat and smokiness from your standard enchilada sauce to give a nice balance to the natural sweetness of the filling. By adding chipotle peppers in adobo and chili powder the sauce has a wonderful depth of flavor. 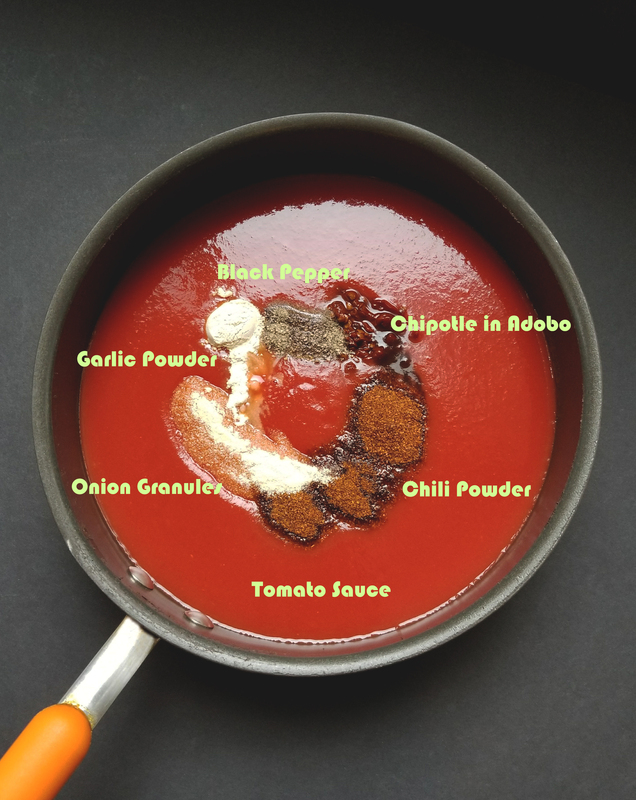 This enchilada sauce is a great staple to have on hand. 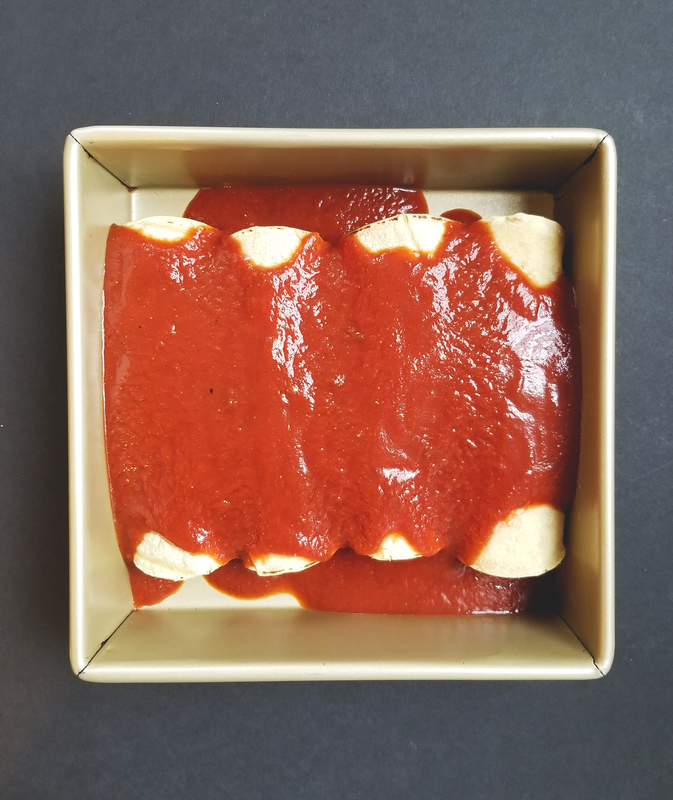 Make a double or triple batch and keep in the freezer for a quick sauce anytime you have a hankering for enchiladas, nachos, or a Mexican inspired bowl. Packed with greens, beans, tubers, whole grains, and tomatoes this meal is a wonderful way to get children ( and adults!) to eat more vegetables, you can diced the dark greens really fine and “hide” them in the filling if you have picky eaters. When your food is smothered in delicious smoky sauce it is easy to add as much goodness as you want inside. In this particular recipe I use corn tortillas because they have a more complimentary flavor and do not have any added oils, but you are more than welcome to use any kind of tortilla that you wish, regular flour, brown rice, or sprouted tortillas are always good options. Just remember that other tortillas will be larger so instead of having three or four enchiladas you might only need one or two. 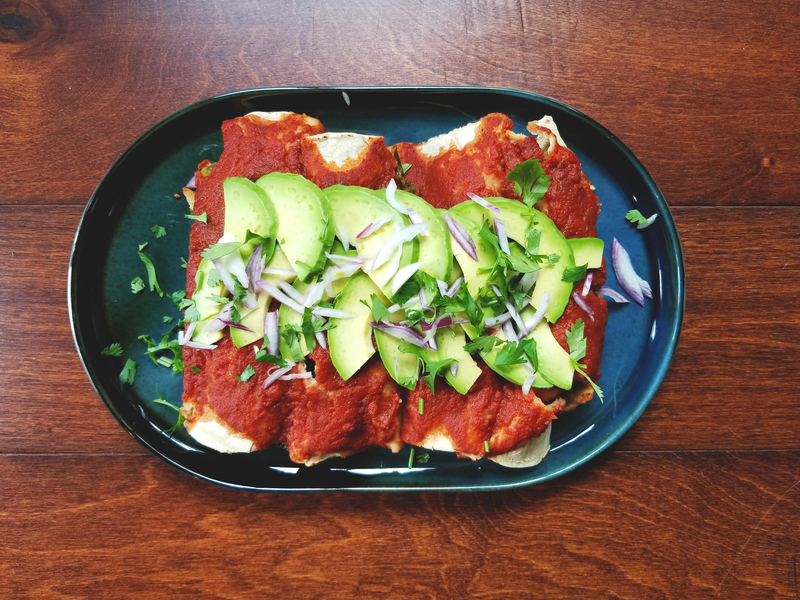 I topped these enchiladas with sliced avocado, red onions, cilantro, and a squeeze of lime. There is no wrong or right way to top enchiladas so have fun with it. Other options could include fresh guacamole, a dairy-free sour cream, toasted pumpkin seeds, scallions, black olives, dairy-free cheese, and of corse shredded romaine lettuce. This meal is a bulk recipe meant for those people who want dinner for tonight, plus leftovers for later in the week, unless you are having friends over! Enchiladas freeze wonderfully you can portion them for a family meal or for individual lunches. Leftovers will keep covered in the refrigerator for up to 3 days, reheat in a 350-degree oven for 15-20 minutes or until warmed through. 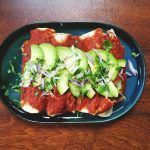 These spicy enchiladas make for a perfect homemade meal ready whenever you are, all you need is fresh toppings. A hearty and nutrition packed entree perfect to warm you up on a chilly night. Spicy, savory, fresh, and saucy! Prepare the enchilada sauce. In a medium sauce pot, place the tomato sauce, adobo chilies and all of the dry spices. Bring to a medium heat and whisk together until the consistency is smooth. Set Aside. 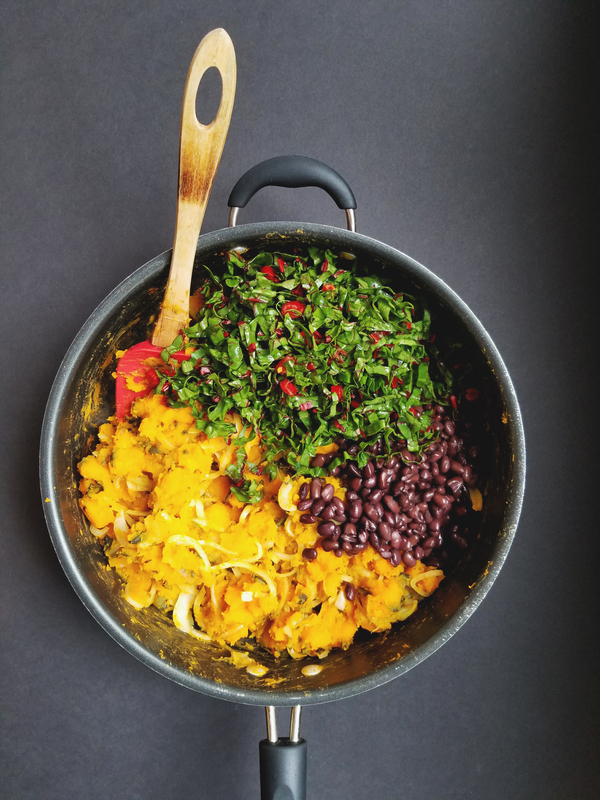 When the squash mixture is just fork tender add the chopped poblanos, black beans, swiss chard, and mix until the swiss chard barely begins to wilt. Set filling aside. Wrap tortillas in damp paper towel or kitchen towel and microwave for 20 seconds to warm them and make them more pliable. Pour a bit of sauce into the bottom of 2 9×13-inch baking dishes (or whatever oven safe bake ware you have) This will help the enchiladas from sticking to the bottom. Take each corn tortilla and fill it with a few heaping spoonful’s of the butternut-chard filling and roll up the tortillas. Place the tortillas seam side down at one end of the dish. Continue until all the tortillas are filled and wrapped. Then pour the rest of the sauce over the top of the enchiladas. Use a spatula or spoon to work the sauce into all of the exposed tortillas. 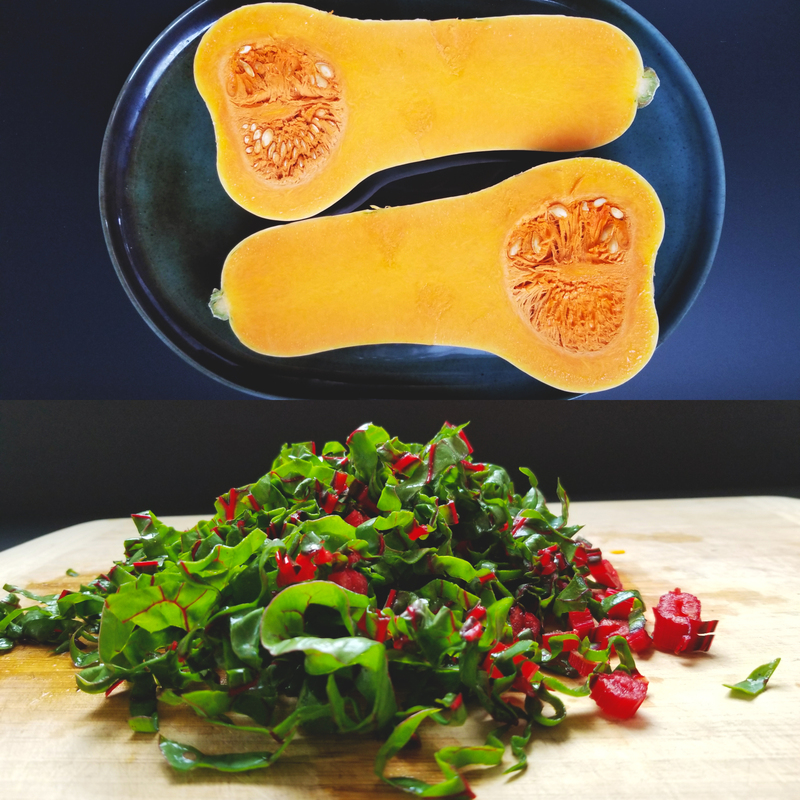 *If you are unfamiliar with cutting a fresh butternut squash you can easily replace it with pre-cut, cubed squash which I have seen in many stores including Costco, Safeway, and Trader Joes. The cook time will depend on the size of the squash cubes, the bigger the cubes the longer the cook time. *You can also use canned green chilies if you don't have access to fresh poblanos. *This make 2 casserole dishes of enchiladas, with the intention of one for eating fresh and one for leftovers. You can also use the full recipe for a crowd!